A U.S.-Japan “2+2” meeting of the U.S. 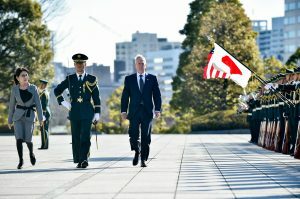 Secretaries of State and Defense with Japan’s Ministers of Defense and Foreign Affairs was scheduled for this week, but was postponed. Apparently, it was the American side that postponed it, on the official grounds of a crowded calendar, and on the unofficial grounds that the Japanese cabinet was due to be reshuffled next month. The Americans have a good point – it would be better for new Japanese cabinet officers, rather than possible lame ducks, to meet their American counterparts. On the surface, postponement of a high-level formal meeting between the Secretaries of State and Defense on the U.S. side, and the Ministers of Foreign Affairs and Defense on the Japanese side might be considered bad news. It might be interpreted as a signaling diminished interest on the part of the United States over its relations with Japan generally and that neither the optics nor the substance of these meetings ranks high on the U.S. agenda. The reality, however is that U.S.-Japan relations are in excellent shape and maintaining and strengthening ties remains a high priority in both countries. Communications among government officials at all levels are frequent, substantive. and effective. Postponement, or even elimination, of the kind of set-piece, ritualistic negotiations represented by the traditional 2+2 meetings would have no true negative impact; indeed, it might provide some advantages. Formal annual meetings of the American Secretaries of State and Defense with their foreign counterparts in allied or partner nations were established decades ago, long before the age of near universal access to breaking worldwide news and instantaneous communications. They were designed to address ongoing issues in bilateral relationships through formal papers, personal high-level, well-staffed discussion and communiques. Today issues must be addressed as they happen. It is unthinkable today for a government spokesman to say that an important issue or incident in U.S.-Japan relations – say an accident involving U.S. forces in Japan or a North Korean missile launch – could wait to be addressed at a 2+2 meeting months after it occurred. U.S.-Japan communications and consultations now take place rapidly and smoothly. As described in former Sasakawa USA Fellow Jeffrey Hornung’s recent research, there are frequent formal and informal teleconferences, VTCs, and e-mail exchanges at all levels between U.S. officials and their Japanese counterparts. President Trump and Prime Minister Abe talk frequently on the phone and coordinate their efforts at the many multilateral summit meetings they attend, from the G-7 through APEC. As a result of this connectivity and shared interests and values, the U.S. and Japan have been strong and coordinated supporters of each other’s policies on all the important challenges that face both countries, from North Korea through ISIL. However, one of the traditional functions of 2+2 meetings has been to bring attention to the long-term issues that are neglected in the scrum of breaking events. When the four Ministers do meet this fall, the following issues would benefit from serious, quiet U.S.-Japan consultation and strengthened long-term coordination: Quickening the pace of the relocation and redeployment of U.S. Marine forces on Okinawa; with the South China Sea relatively quiet, strengthening U.S. and Japanese plans to assert freedom of maritime and air maneuver and supporting regional resistance to future Chinese aggression; and coordinating strategies to deal with China’s “Made in China 2025” strategy, its plan to dominate the ten most important areas of technology in future. Good communications and consultation on current issues must be supplemented by combined planning to deal with long-term threats and opportunities.